We develop Windows applications for your company’s private network, and e-commerce Web sites that are accessible by everyone. In addition to writing the software, we can install it and maintain it throughout its lifetime. We do work for public companies, private companies, non-profit organizations, government institutions and even startup entrepreneurs. DataCorp programmers have been designing custom software since 1982, and we have experience in many different industries. We are proud of our reputation and we see each new project as an opportunity to build on our history of quality. If you already know exactly what you need, we can prepare a detailed proposal based on specifications. If you are not sure if our services are a good match for you, we will be happy to meet with you at no charge. We are proud of our reputation and we see each new project as an opportunity to build on our history of quality. If you already know exactly what you need, we can prepare a detailed proposal based on specifications. If you are not sure if our services are a good match for you, we will be happy to meet with you at no charge. If you are not currently a DataCorp client, Custom Software is a good place to begin. If you are already a DataCorp client, you may want to visit the following: Internet Services, Hardware products, Software products, and Software services. DataCorp is based in Houston, Texas, but we do not limit ourselves to this area for custom software development and other types of consulting. We have custom software clients throughout the United States and Canada, as well as Far East and European countries. Whenever person-to-person meetings are necessary, DataCorp will be happy to send a representative to your office, wherever it is located. One of DataCorp's aims is to help you find the areas where custom software will benefit your business. With custom software, you own the rights to the software, and you do not pay additional fees to add users. You are free to resell the software to any other party. Custom software can be used to combine features from other packages with the features that your company needs. DataCorp offers networking services for all businesses no matter the size; from the first step of wiring to the final step of setting up and maintaining network connected devices such as servers, workstations, routers and firewalls. DataCorp can also accommodate the maintenance and support of existing networks. Implementing new hardware or reconfiguring network security on an existing network can be intimidating, but we can assist with easing any changes to a network with the support and services we offer. Due to the ever evolving field of mobile computing devices both in software and hardware realms, we can recommend the level of service which will be advantageous our customers. DataCorp offers an intelligible approach to this fast growing trend in information technology. We can offer a turnkey solution to this complex platform. Over the course of a decade, cloud computing has become integral in the world of information technology. Along with it, a proliferation of related products and services has evolved to protect and backup the information stored there, not to mention the huge number of applications and programs that are now dependent on the cloud. It has permeated the tech sector so much that we’ll often be using the cloud and cloud services without even realizing. This technology eliminates the infrastructure needed to have some or all IT processes to be conducted in house or remotely. Thus eliminating multitude of cost factors namely, hardware and software upkeep. As a DataCorp customer, you can purchase almost any type of hardware or software and usually pay through your DataCorp account. 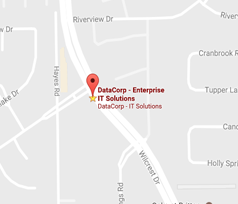 DataCorp will acquire the hardware for you, deliver it, install it, and provide training and support as needed. What is the cheapest way to get malware protection on all my computing devices? What is the cheapest way to upgrade everyone in my company to the latest collaborative software packages? © 2016 DataCorp. All Rights Reserved.